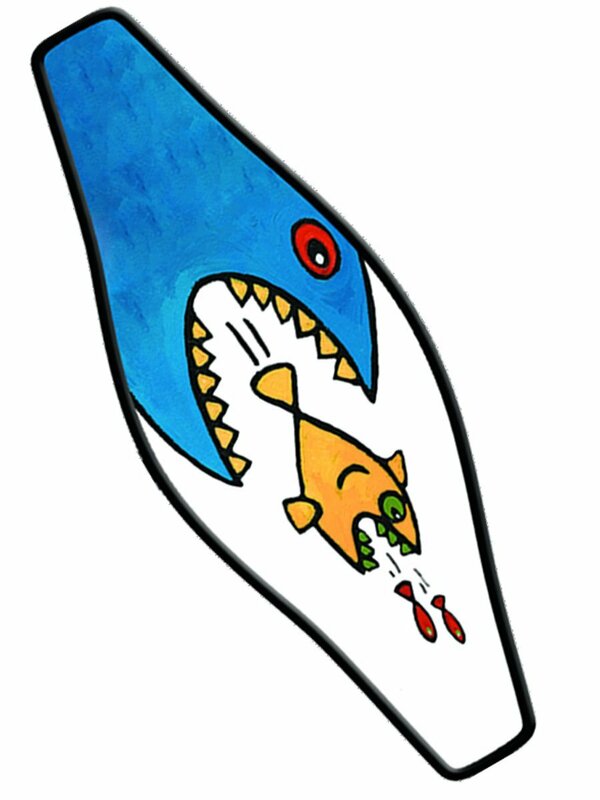 Buying gifts for scuba divers - whether it is for a birthday, graduation or holiday - can sometimes be difficult. To get your imagination going, we have some great ideas for presents which we think any diver would be glad to have. This list of gift ideas covers a variety of objects from practical to whimsical. 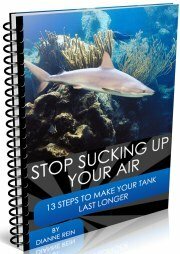 Hopefully you can find something to bring a smile to the face of your diver. All the presents on this page are in the moderately priced range which we have defined as $10-$50. 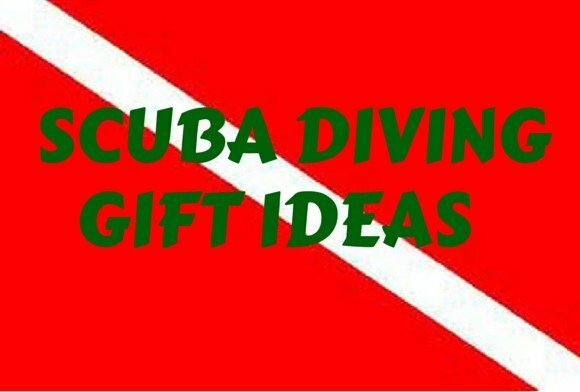 We have another page of gifts for scuba divers that are appropriate for both men and women. So let's get going and let the shopping begin! 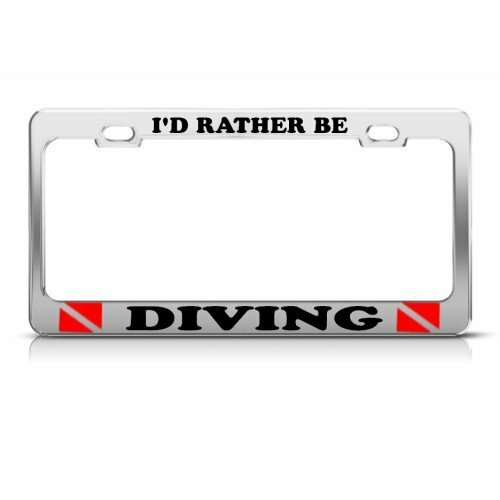 Instead of a boring old frame from the dealer - or no frame at all - let your diver show his love for the sport. And he will think of being under the water every time he walks to the car. What better present than to transport someone to their dream destination - if only for a minute. 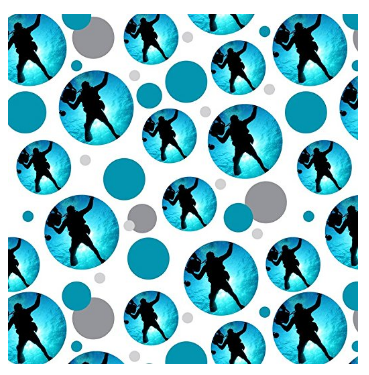 What diver wouldn't love to get a present wrapped in this unique wrapping paper? It shows you were thinking of them as you prepared your gift. A unique gift for scuba divers too - I can bet they won't have this at home. You can choose from other underwater themed pictures also. Personalize your gear with these waterproof stickers. Never get your gear mixed up again on that dive boat or rinse tank. You can customize these tags with your personal info. While they are a bit pricey (imho), so is dive gear :). Worth the added measure of security. 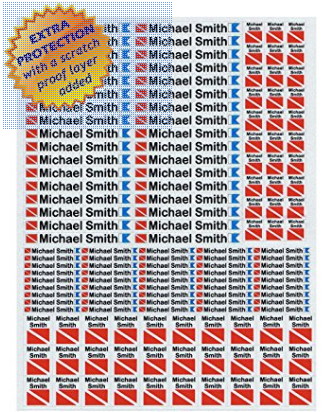 Click here for waterproof stickers for your dive gear. Who says all the gifts for scuba divers have to be for the divers themselves? Let that pet that the diver loves so much get in on the action too. This one adjusts to fit 11 1/2" to 19" necks. Don't let the diver in your life go off with a plastic mask strap. If you have ever used one, you know how it pulls your hair. Use this easy to cover wrapper - just put it around the existing mask strap and voila - no more pulled hair. So easy yet so good. I would never use a mask again without a neoprene cover or strap. There are a variety of designs to choose from. Pick one to suit your divers personality! There is nothing worse than having to call a dive because of a blown o-ring. 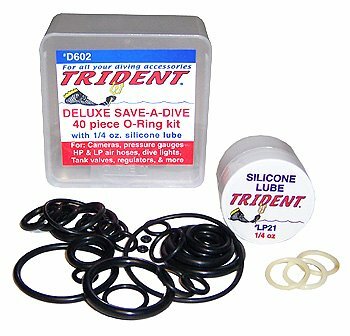 Well, with this save-a-dive kit, your diver can keep on diving. It comes with 40 o-rings and silicone lube. Use it for o-rings on hoses and tanks as well as lights, regs, cameras and gauges. 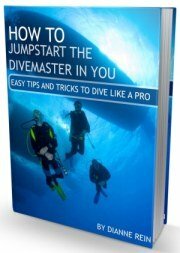 You will be profusely thanked after the diver is able to save his dive! One of those practical gifts for scuba divers. 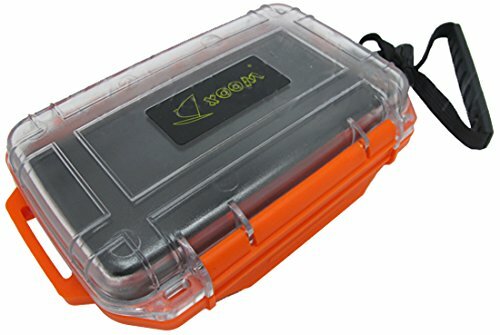 This makes a nice scuba diving present - a waterproof case to protect the important items a diver brings on the boat (cash, credit card, c-card, keys, phone, etc.). It can even go in the water and it rated to 100 feet. So if she wanted to go snorkeling in between/after her dives and didn't want to leave her stuff unattended, it can go in the water with her with no worries. What's better than that? While we are talking about travel, here is a great idea for both the plane and the dive boat. This collapsible water bottle rolls up when not in use to save that precious space in your bag. We know how important it is to stay hydrated, especially when diving. 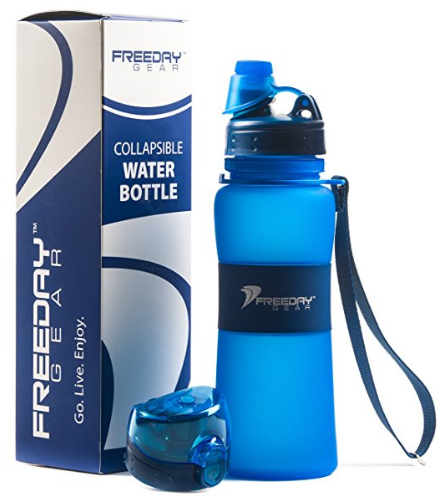 This bottle comes with two leakproof lids, a one touch and a twist cap. (Disclosure: This is our product which we manufacture). Now this present will be sure to get many comments. It's a unique gift and will make the diver feel right at home :). A very realistic replica of a scuba diving tank. This water bottle is made of stainless steel and 100% BPA free. It's a fun gift and will be perfect for their next dive trip! 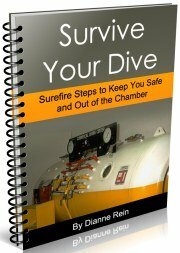 Now this is a practical and useful gift for a scuba diver. 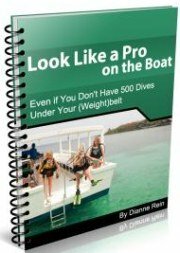 This will hold all your diver's gear for easy transport on and off the dive boat. You always want your gear together and in a compact space for your ease of mind, the safety of your equipment and to be considerate of other divers space. This rugged mesh bag can also just be dipped into the rinse tank with all the equipment in it if in a rush. 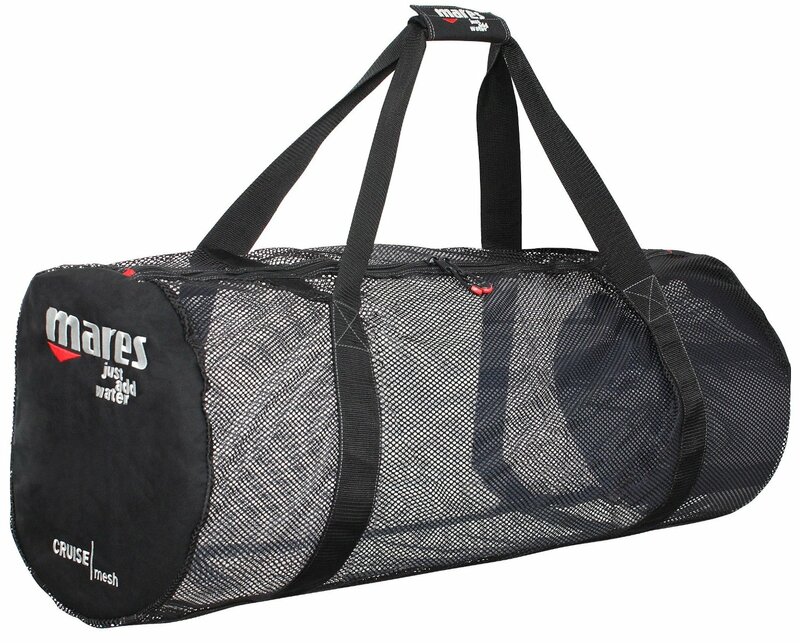 The bag also folds for easy and compact storage when not in use. I never go diving without my mesh bag. Gets great reviews. You want to make sure your loved one is safe. 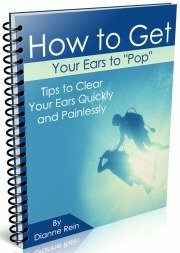 This scuba gift can help, especially if a diver gets separated from the group. 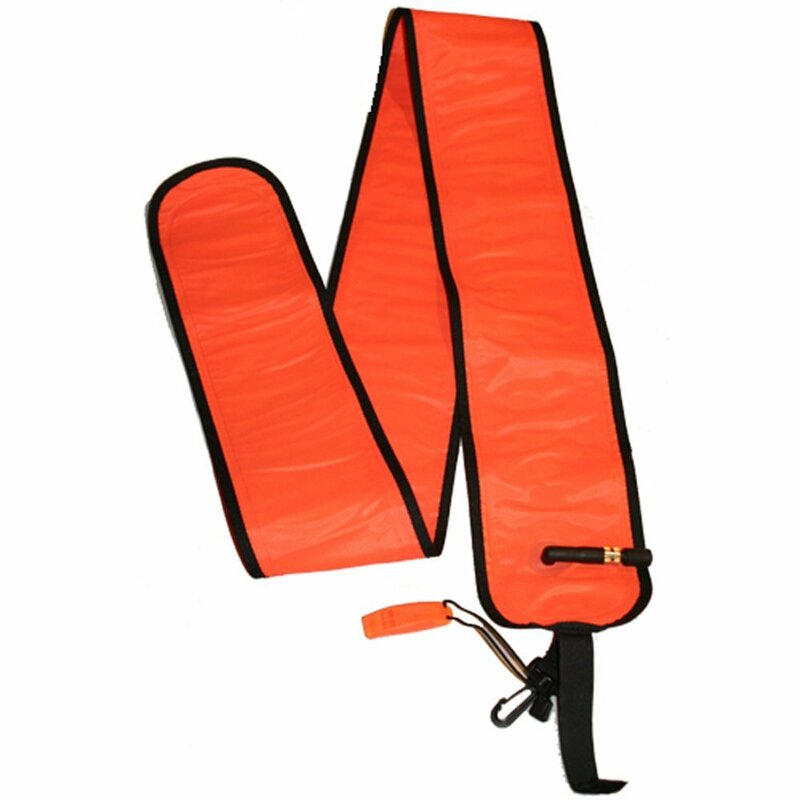 This SMB is 6 feet tall (don't buy a shorter version) and is in the highly visible orange color. It also has a whistle attached for another safety signaling device. Great idea for all dives but pretty much a necessity on drift dives where it is much easier to get separated. 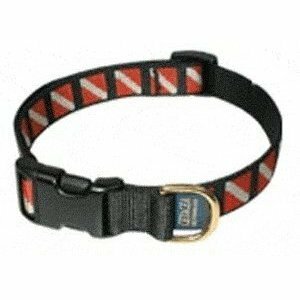 Let your divers know you love them and want them to be safe! One of those practical gifts for scuba divers. Whether night diving or wanting to look into cracks and crevices during the day, a dive light can be a diver's best friend. This one is guaranteed to a depth of 100 meters and is light weight at only 0.8 lbs. Batteries not included (of course). 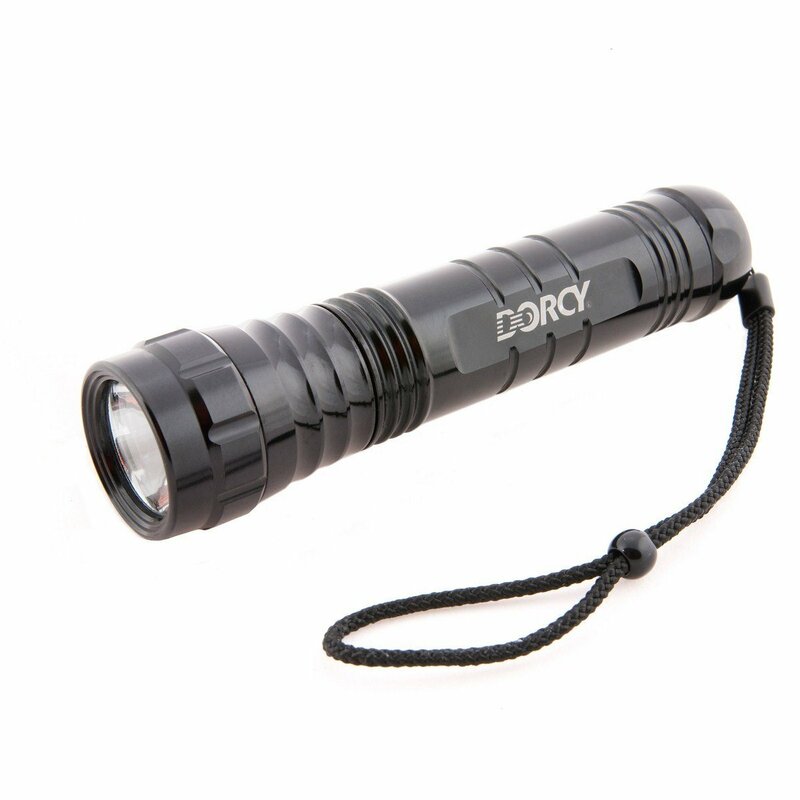 This light gets great all around reviews from divers and should serve your diver well. Another practical and useful dive gift. So there you have it, our list of moderately priced gifts for scuba divers. Ranging from the practical to the whimsical. 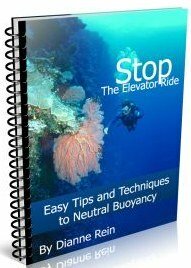 Whichever way you want to go, I hope you can use at least one of these ideas to surprise the diver in your life. No matter the reason for the gift, they are sure to love it. Happy shopping and gift giving! 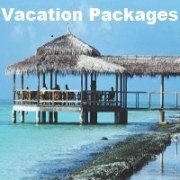 If you are considering some scuba gear, dive watches, etc. 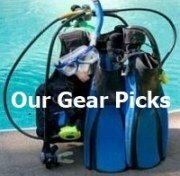 for a gift, you might want to check out our Picks For Best Scuba Gear here.